Welcome to the Millard Fuller Memorial page. Our founder and daily inspiration passed away on Feb. 3, 2009 at the age of 74, but his dream of eliminating poverty housing will live on with each house constructed for a family in need, and in the heart of each hardworking volunteer. Take a look at the events that honored Millard’s life on the one-year anniversary of his death. Read this article about remembering Millard and continuing his important work in the housing ministry. We invite you to explore the photographs, poems and remembrances on this page, as well as watch a recording of Millard’s memorial service that took place at the historic Ebenezer Baptist Church in Atlanta. You may order a FREE Memorial Celebration DVD here. Please return soon for updates, which we are making continually. Unveiling of the "Millard Fuller Memorial Highway." Photos from Millard Fuller’s memorial service, as well as memorials held around the world. Find poetry here honoring Millard. Read here about resolutions passed by Congress in honor of Millard. View the lessons learned from Millard, as read by his children at his memorial service. Read a moving tribute to Millard given by U.S. Senator Mary Landrieu of Louisiana to Congress on February 12, 2009. Check out the Millard Fuller memorial edition of our newsletter, published in spring 2009. Visit our Guestbook to post your own tribute to the founder of Habitat for Humanity and The Fuller Center for Housing. 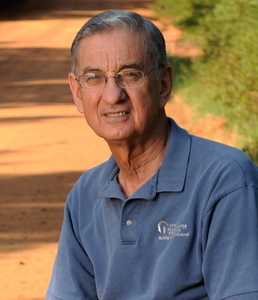 Listen to a selection of Millard’s sermons here. What about you? Ronnie McBrayer speaks in memory of Millard Fuller (February 8, 2009) on Yahoo video.